Alleluia, He has Risen! He has Risen Indeed, Alleluia! A Happy and Holy Easter! OLM beautifully deocrated for the Easter Season! With the death of a loved one or a friend, we often recall that we do share in the victory of the Risen Christ It is at these times that we immediately trust that, by the mercy of Jesus, we are united with Him forever in heaven. But immortality, eternal life, is but the ultimate way we share in our Lord’s triumph of Easter. A second way is so beautifully evident in our lives too. In and through Jesus, we, too, have the power to die to our sins, worries, anxieties, failures, and suffering. With Christ we rise to a new life of virtue, peace, fidelity, and truly find meaning in our lives. The cross is still there but with Christ we can conquer it and it has meaning. Simply ask the cancer survivor, the recovering alcoholic or addict, or even the married couple struggling who persevere and get through their tribulations. The power of the Resurrection of Jesus Christ lives on in our lives! Another way we share in the Resurrection of Jesus Christ is through the sacraments. Jesus desires to imbue His new, risen life into our souls. We call that life of Christ within our hearts grace. Christ gives us grace in many ways, but quite beautifully and profoundly through the seven sacraments of the Church. 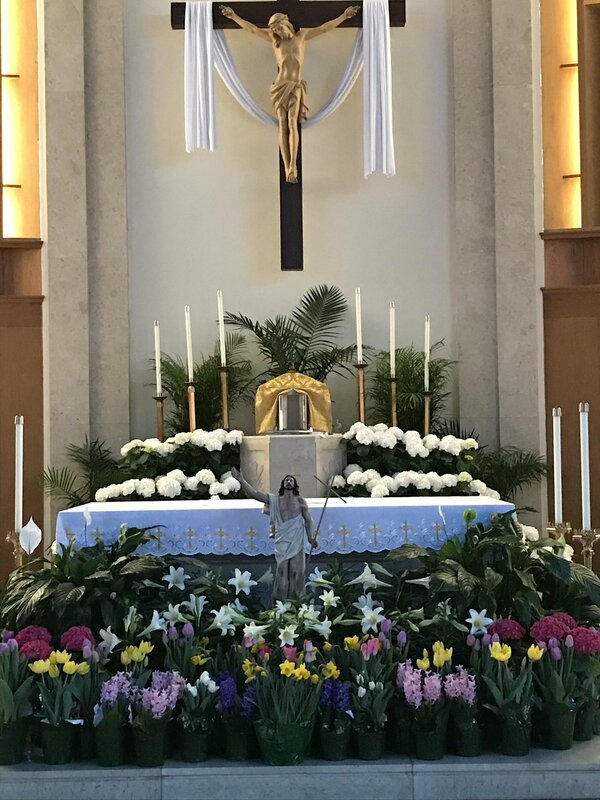 On Holy Saturday throughout the Church across the globe thousands of adults are baptized, profess our Catholic faith, receive the sacrament of Confirmation, and their first Holy Communion at the Easter Vigil Mass. Following the Easter vigil, the newly Baptized and Confirmed Al Behbehani wears his White Baptismal gown and poses with his sponsors, Mary Anne and Rod Weaver, and Fr. Healey, OLM Pastor. Here at the Easter Vigil Mass at Our Lady of Mercy we witness right before our eyes, several people rise to a new life as Jesus pours His light and life into their thirsting, hungry souls. One adult is to be baptized, another adult received into the Catholic Church and several other adults to be Confirmed. It is always a great joy for our parish to welcome new members and fully initiate others. It is truly a sign of the vitality of our Catholic Faith and the parish life at Our Lady of Mercy. Following the Easter vigil, the newly Confirmed Joanne and Gerrianne Exil pose with their sponsor, Kelsey Exil and Fr. Healey. We rejoice as we offer our congratulations to our new Catholics who have made the journey into the Catholic Church. Together we celebrate this great season of joy and glory for the next fifty days of Easter. While it is the beginning of spring in the world around us, it is also spring in the Church. We watch the flowers bloom but we also watch the faith blossom with First Holy Communions, confirmations, weddings, and ordinations. We rejoice in the sacramental life of the Church unleashed from the cross and Resurrection. At Easter, we rise to a new life of grace and mercy as we are renewed in the Risen Lord! This renewal never stops! Jesus is always renewing His Church. We are part of that renewal as we immerse ourselves into the glory of Easter. The gloom, death and darkness of Good Friday do not have the final word! Rejoice, the Risen Christ radiates light, life and love all over! Bishop Tobin preaches at the 2015 OLM Confirmaiton Mass. We are blessed to have our Bishop, the Most Reverend Thomas J. Tobin, celebrate the School Mass on the upcoming First Friday, April 6th at 9:00am. The Bishop will also visit our excellent parish school and see firsthand the great spirit of wisdom and faith of our wonderful students and tremendous faculty. In a special way, we celebrate Bishop Tobin’s birthday. He marks his 70th birthday on Easter Sunday! (It’s not an April Fools joke!) Please join us this Friday as we welcome our Chief Shepherd! A very Happy Easter and Birthday Bishop Tobin! On behalf of Fr. Barrow, Fr. Connors, Deacon Dowd, our religious sisters, and myself, I wish you a Blessed Easter! You are in our prayers and are remembered at Easter Masses. Alleluia, He has risen! He has risen indeed, Alleluia! Happy Easter! Do good. Be well. God Bless. Go Sox! !